When constructing plans for home or office interiors, developers need to provide accurate estimates for subcontractors before placing their own bid. Use of the highest quality materials doesn’t always come with a cheap price tag. However, using materials that catch the eye of prospective buyers is of extreme importance. Marble is one of the prized materials for use as floor tiles, counter-tops, thresholds, bathroom walls, and window sills. Until recently, obtaining suitable marble tiles was quite expensive because of the high cost of manufacturing and overseas shipping. Stonexchange has solved this problem through a unique partnership with overseas quarrying operations and cutting/polishing facilities. Our company provides top-quality natural stone tiles to commercial contractors and flooring product retailers, and our prices are well below retail. We import marble in full container loads, carry all the popular color shades and textures, and distribute full-crate orders to customers throughout the nation. Marble is a beautiful product, one that lasts forever when installed as a flooring surface. When considering the finished look to a residential or commercial development product, marble should be at the top of the list of preferred materials. Here are five reasons why your development project needs marble floors. 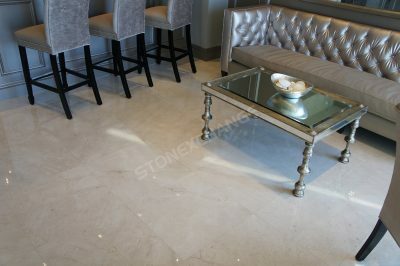 A shiny, polished tile made from natural marble stone is as beautiful as it is functional. A floor covered with marble tiles generates an immediate impact on the visual sensory system. The elegant look of this material creates an atmosphere of opulence and high status level. When someone visits a development project such as a new residential neighborhood, several of the sample living areas are open for viewing. There is no mistaking the difference between an individual’s reactions when he or she is shown a hardwood/carpet combination living room and then a similar indoor area covered in luxurious marble flooring. First impressions can and usually are the most important when a new property is put on display in the form of sample interior designs. These showcase units will indeed make a lasting impression when the floor is covered in beautiful marble tile. Best of all, the prospective buyer is amazed when he or she is told about the affordability of this fine-quality stone material. Marble used to be expensive to ship and distribute, but Stonexchange makes it more affordable than ever to procure the world’s finest natural stone tiles at far below retail prices. Giving the customer the choice of marble tiles, thresholds, and counter-tops is always wise. Much like hardwood or carpet, marble flooring sets the stage for design of the room interior. While it is true that some development projects include specific interior decorating plans created to maximize the visual enhancement of a kitchen or living area layout, substituting marble is usually a simple process. For every design of kitchen and every floor plan of a living or sleeping area, there is a shade and texture of marble that will work extremely well when combined with other accent elements. For example, a kitchen floor covered in light crema marble stone will blend perfectly with other neutral shades used for walls or cabinetry. D arker shades of marble can be used as a countertop material or for a kitchen backsplash. It is generally a simple process for an expert tile installer to determine how much material is needed and which shades will most favorably highlight the area. Neutral shades of cream/beige are also good choices for the living area or for an office foyer. The effect on the visual sense is gentle and at the same time creates an effect of luxury. Darker shade accents such as cabinetry, shelving, or window dressings work very nicely with medium-shade marble tiles to create a good complementary effect. Our company has noticed that most property owners will prefer matching shades of marble in the bedroom. The same color and texture marble can be used for use as tiles, saddles, and window sills. This often becomes the primary color shade of the room and is complemented by other shades of wood shelving, textured walls, and furniture. Marble tiles are expertly cut at a fabrication facility. Larger slabs are thinned using cable saws, and the resulting sheets are cut into squares with special radial saw blades. The material is graded according to color and texture, packed into large wooden or plastic crates, and sent overseas to a distribution center. When a commercial customer orders a supply of marble floor tiles from Stonexchange, the crate can be easily unpacked and the individual pieces sorted and arranged for placement. A large order means that plenty of arrangement possibilities can be examined in order to get the best possible texture match for an entire floor surface. If the tiles are to be placed together without the use of grout between the stones, installers will find that the squares of marble have perfect 90° corners. This makes it easy to install a line of marble tiles without deviating from a straight path. 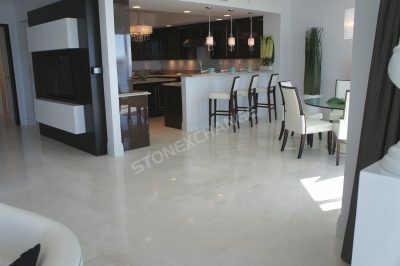 Once in place, marble tiles need only set for a day or two before they can be walked upon. The high-polish finish given to the stone will resist scuffing and scratching from any lingering particles that may settle on the floor. A large construction project involves the ordering of thousands of pieces of marble tile. Smaller retailers often have to order these full crates from an overseas distributor, and a lead time of up to three months is not uncommon. A direct importer such as Stonexchange is a far more reliable source of top-quality stone because we receive shipment from our overseas manufacturing partners on a continuous basis. In northern climates, construction slows considerably during the winter season, and flooring retailers may not carry a large quantity of flooring tiles at this time of year. However, Stonexchange accommodates commercial order requests throughout the winter, and delivery in December and January is just as prompt and reliable as it is during the busy summer months. Matching color and texture between floor tiles, thresholds, and window sills can also be a major headache for installers. The best source for matched material is through a direct importer and distributor, one that receives marble sills, saddles, and tiles from the same manufacturer. Ordering in bulk from a direct-to-customer importer eliminates worries concerning matched color shades, vein patterns, and overall texture. When marble tiles are shipped as full container loads from the manufacturer, freight costs are drastically reduced. This savings is passed on to the customer. Although marble is a very heavy material, ocean freight charges depend on the number and size of the containers being shipped. Full crates mean a lower per-piece cost, and since the material is sold directly to commercial customers, distribution costs are also lower. In the end, construction companies, subcontractors, and installers will enjoy lower prices on this valuable material, and they can therefore put in a lower bid when competing for project assignments. Of course, the property owner will also benefit because he or she now enjoys a home that is elegantly finished with a beautiful marble floor, and the price tag of this elegance is lower than expected. Non-standard size tiles are often requested by commercial installers, and the manufacturers that produce marble tiles are well aware of this demand. When a non-standard size order is received by a direct importer, a lead time of approximately two months may be required. However, Stonexchange does not charge extra for custom-sized marble tiles because these cost no more to manufacture than the standard 12- or 16-inch squares. When considering the installation of a marble floor, installers look at the most in-demand color shades referred to in the design plans. Crema Marfil and White Carrara are two of the most commonly used shades of natural stone because they work exceptionally well when instructions call for beige or neutral colors. We carry a full line of matching tiles, window sills, and saddles that are perfect for use when building instructions call for Alabama, Cherokee, Georgia, or Vermont marble. We also stock granite in the popular Absolute Black color shade, a popular stone used for kitchen countertops. All of our material is packed in specialized crates that are easily loaded and unloaded from overland freight trucks. We can send an order directly to a retail outlet, construction site, or storage facility. Because we maintain a full inventory of product at our Florida warehouse and distribution center, we can arrange a shipment of thousands of tiles and have it on its way to the client in less than three business days. There is no substitute for a marble floor when it comes to beauty, long-lasting quality, and property value enhancement. This material is available at wholesale prices from Stonexchange, one of the nation’s leaders in direct distribution of natural stone tiles, sills, thresholds, and mosaics. We invite construction companies, installers, and home improvement centers to contact us with any questions concerning the obtaining of beautiful marble tiles at fantastically low wholesale prices.